I created art.park.data for the East London Canvas, a 32.5m long data visualisation drawing from data collected by children taking part in Space Studios' ‘School’s (Not Quite) Out for Summer’ project. 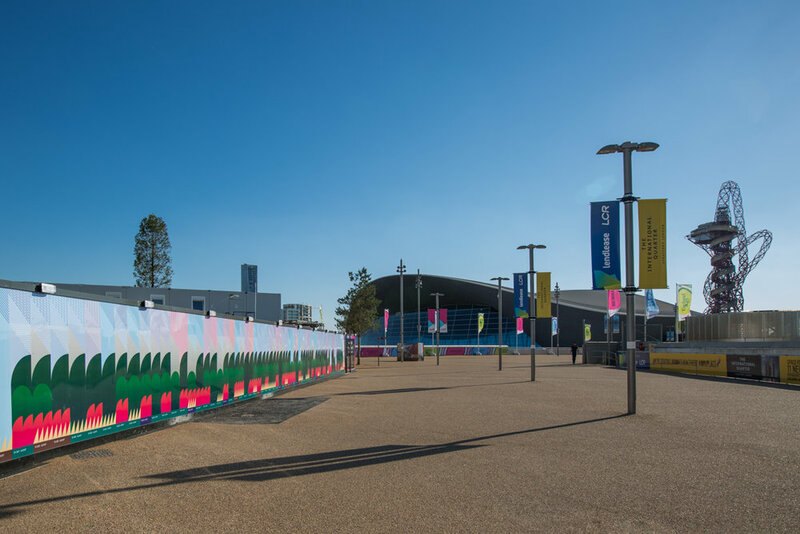 The children became ‘data explorers’ in Queen Elizabeth Olympic Park, collecting measurable information, or data, with creative technologists Codasign. Using Raspberry Pis fitted with special sensor HATs, they gathered the data and then explored how it would be possible to present it in a pictorial or graphical format. This mural functions as a collection of these moments, where the data becomes a souvenir of the children’s experience in the park. It explores ways of ‘recreating’ the Park landscape from the data the children collected, alluding visually to the slightly imperfect aspect of this task: while data can provide insight, it doesn’t fully illustrate the emotional experience of being outdoors in a park. Instead, we make guesses and try to re-create it as best we can, but the outcome will be diffuse, blurred, and hazy. East London Canvas is created by Lendlease and LCR in partnership with Foundation for FutureLondon.